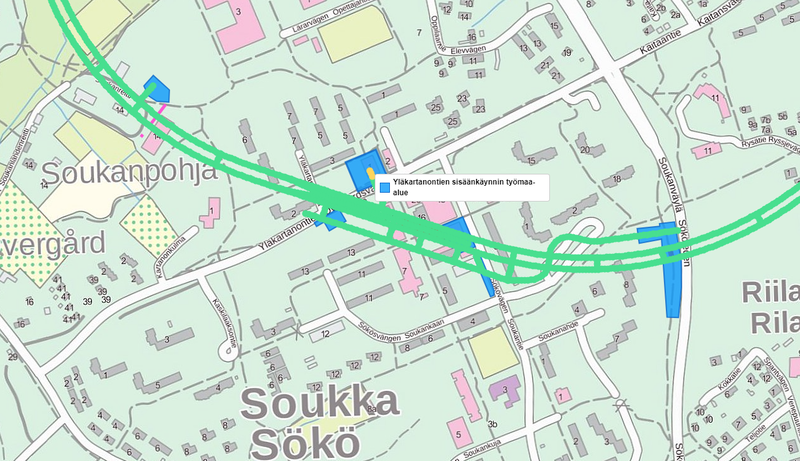 The excavation as well as the demolition preceding the excavation for the Soukka construction site of the Länsimetro for the Yläkartanontie entrance will start in March. Preparations were started in December for the construction work with traffic arrangements on Yläkartanontie. Along with the exceptional traffic arrangements, a part of the parking slots will be removed from the Yläkartanonkuja parking area. Replacement slots have been arranged at Kartanonkulma. A worksite fence will be built in the next phase and a worksite will be established. The demolition of the so-called Puotitalo will start after mid-March. At about mid-May the construction of a sheet pile wall will start, which will cause noise pollution. At the end of May the actual excavation of the entrance itself will begin, lasting until the end of July. Information will be given regarding every work phase separately as the work progresses and the schedules become more exact.